Have you ever passed a track gang and wondered what all those machines actually do? Here's your answer and more. You'll visit a tie replacement and surfacing gang to witness the amazing parade of equipment as it progresses down the track. Closeup shots explain what each machine does. Then you'll tour a major shop to see in detail how coal hoppers are built. Next you're off to view undercutting machines cleaning ballast on BNSF. Did you ever wonder what it's like to work as a dispatcher? You'll visit a Norfolk Southern facility where the chief dispatcher explains the operation. Returning to BNSF, you'll see one of the most awesome pieces of railroad equipment: the P-811 concrete tie layer. This gigantic device lifts welded rails from the ties and forces them to both sides of the machine. It then removes old ties from the right of way, replaces them with new ones, and puts the rails back in place, all in one continuous movement. It's an absolutely fascinating, complex apparatus. You're sure to enjoy this and all of the other exotic equipment Workin' on the Railroad! This is one of the best! !, lots of great video and action, and well explained, there is only one boring segment, and I'm sure it is outdated, the one on dispatching, this is one you can watch over and over, simply put, this is a MUST HAVE!! Robert Inwood (British Columbia - Canada) on 2015-03-23 11:44:45. 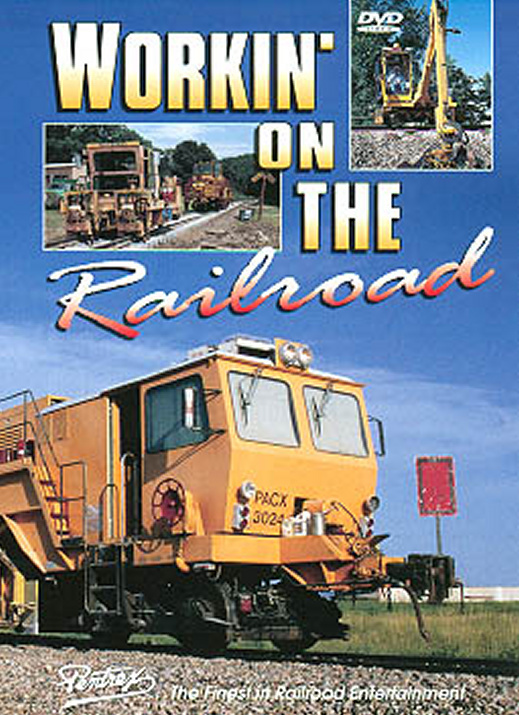 A very interesting DVD - as noted - a four part presentation that features two segments on track maintenance equipment and techniques, as well as, segments on the construction of a modern 'hopper' style rail car, and a visit to railway control center that shows how trains are organized. - it was a real eye-opener! The other 2 features were also very well done - but just not really stuff I'm into. Over-all, a great package! chris collins (fletcher north carolina) on 2014-12-09 19:40:41. Richard (Jersey shore) on 2013-06-04 18:30:39. Very interesting and informative. Gave a great insight into what working on the railroad is all about. Gilmer Colvard (Big Stone Gap VA.) on 2013-05-16 08:50:45. Very educational. Always wondered how those machines worked. Also, deeply insightful and fascinating. Texas Hi-Railer (West Texas) on 2012-10-11 12:48:17. This is truly an awesome DVD if you want to know what it's like to work on the railraods. This footage shows some incredible machines that I had no idea existed? It also shows the old rail gangs and how they operated prior to all the huge machines they have today on the railroads. It's excellent quality, both images & sound and is the typical fine quality of Pentrex DVD's. I highly recommend this DVD for your railfan library! Tom (Daytona Beach, FL) on 2011-09-21 06:17:33. Excellent coverage of much of the technnical nature of MOW. Very interesting and well presented. Chuck D. (Saratoga, CA.) on 2011-06-26 02:03:28. I love to see how things are done. Modern track laying has sure changed over the last 50 years. This DVD does a good job of showing some of the new methods. However, as another viewer mentioned, without some visual diagrams or drawings it is difficult to envision how some of the actions are being accomplished. After watching several procedures - I said to myself - How in the hell did they do that? I wish that someone would make more videos on track laying work including the new half mile long rails that are welded together and the new concrete ties and fasteners etc. I'd also enjoy seeing some videos on building locomotives and discussions on how they use Two Cycle instead of Four Cycle engines and the reasons etc. I enjoyed this DVD. Arty (Australia) on 2011-04-20 16:47:08. A fascinating look at the amazing machines, and those operating them, used for track maintenance along with a good commentary. If you are as fascinated as I am in big construction equipment, diesel locomotives, and machinery, this is definitely something to see! Jeffrey Ornstein on 2008-04-06 19:41:02. This video really demystified the entire track laying process. I've seen crews quite often replacing rails and ties on the outdoor sections of the New York City Transit System. Even though this video is mainline railroading, I'm sure there are many similarities. Some of the equipment I've seen is similar to what was in the video. I wished there was just a little bit on how tracks are replaced in a tunnel. That I keep wondering about! This is one of my favorite videos! Pentrex did a really good job of showing how all the maintenance machines work in close detail with good narration that isn't too obtrusive. The second half shows an automated concrete tie and welded rail laying machine that is just mind boggling to see. <i>HEADS UP!</i> Turn the Subwoofer Volume DOWN! <p>Railroading 101 - What Happens <i>BEFORE</i> you get to watch the train! These machines are amazing. They are like a factory on wheels. I am surprised that Discovery's Science Channel has never done a program about these things for their "Build It Bigger" or "How It's Made" series. <p>The program starts out with a Norfolk Southern Timber and Surface Gang that removes and replaces wood ties. We also get a peek inside the kitchen that travels with the crew. Next we get a look an the NS car shop in Roanoke rebuilding Top Gon coal hoppers. Then we are off to the BNSF Thayer Sub for an undercutting project on a maintenance blitz that closes the line while work is done. Now it is back to the NS for a look at a Dispatch Center (I'm not sure which is worse - I have been on tours of both Railroad and Public Safety 911 Dispatch Centers - I think working in either one would turn me into a babbling fool in pretty short order!). For the last stop on our behind-the-scenes tour we go back to the Thayer Sub to watch a concrete tie layer. <p>Narration is excellent, providing good descriptions of what each machine does and how it works. The photography is also top quality. Every kid that has ever taken a toy apart to see how it works will love this video (Inquiring Minds Want to Know)! The only thing that could have improved this video is animated graphics showing what the machines do that the camera can not see. Unless you have some sort of an aversion to watching railroad videos that do not show dozens of trains, this one should be at the top of your <b>MUST HAVE</b> list! We have all seen the track gangs hard at work. They are slow and can tie up traffic. Most of us wonder about how this equipment actually works. This movie is the most complete and imformative video made on the working of the maintanance of the railroads. All the equipment and explainations is presented from start to finish. Very interesting. The final segment is the massive concrete tie layer. You have to see it to believe it. Amaizing. This machine is unlike any other made for railway maintanance. The video gives full details and excellent shots of the operations. Don't forget the car rebuilding center. It's a giant model shop using a bonding that is a little stronger that plastic glue. Recycling is big time here. We receive a real learning on how the main line railroads save some costs. On to see and learn the dispatch center. It may take a while to understand it all, but in the end we can understand how it is that so many trains can operate on on line all at the same time, without major problems. You need to be all eyes and have extreme patience to work in these offices. Well made presentation that receives high marks. A must for all the train video lovers and collectors. dmacleo (Maine) on 2014-06-26 16:37:13.
some really cool stuff to see.